Namaka Mennonite Brethren Church, 1950. 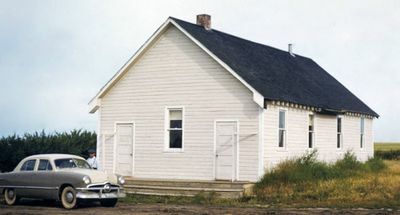 The Namaka Mennonite Brethren congregation in Namaka, Alberta began services in 1942; it was an Evangelical Mennonite Brethren church prior to 1942 when it affiliated with the Mennonite Brethren Conference. The congregation was organized in 1927 with 30 members. The first building was occupied in 1932. The congregation originated through immigration from the Soviet Union. The presiding minister from 1927 to 1947 was A. A. Toews. Other ministers were A. P. Willms, G. Dirks, A. G. Martens, Heinrich Klassen, and C. Penner. Membership in 1955 was 34. The congregation dissolved in 1972. The language of worship was German. Toews, John A. A History of the Mennonite Brethren Church: Pilgrims and Pioneers. 1975: 166. Available in full electronic text at: https://archive.org/details/AHistoryOfTheMennoniteBrethrenChurch. Toews, A. A. and Marlene Epp. "Namaka Mennonite Brethren Church (Namaka, Alberta, Canada)." Global Anabaptist Mennonite Encyclopedia Online. July 1986. Web. 22 Apr 2019. http://gameo.org/index.php?title=Namaka_Mennonite_Brethren_Church_(Namaka,_Alberta,_Canada)&oldid=163452. Toews, A. A. and Marlene Epp. (July 1986). Namaka Mennonite Brethren Church (Namaka, Alberta, Canada). Global Anabaptist Mennonite Encyclopedia Online. Retrieved 22 April 2019, from http://gameo.org/index.php?title=Namaka_Mennonite_Brethren_Church_(Namaka,_Alberta,_Canada)&oldid=163452. Adapted by permission of Herald Press, Harrisonburg, Virginia, from Mennonite Encyclopedia, Vol. 3, p. 808. All rights reserved. This page was last modified on 9 March 2019, at 03:26.